Reviews of the Panasonic Lumix DMC-FX60 from around the web. In fact the FX60 only offers two significant improvements over the older model. It features Panasonic's improved Optical Image Stabilisation system, dubbed Power OIS, and also an improved autofocus system which Panasonic claims is twice as fast as the FX40. While these are certainly worthwhile additions to an already very competent camera, and will no doubt tempt new customers, existing owners of the FX 40 or FX37 will have to ask themselves if it's enough to justify upgrading. 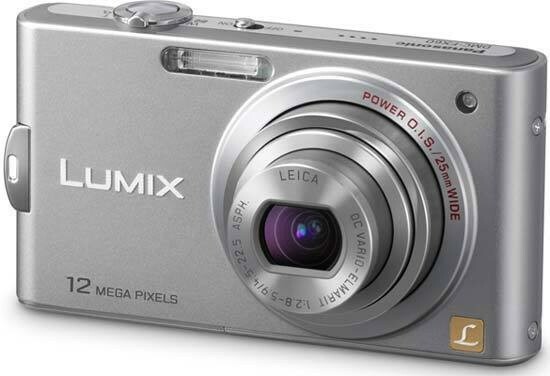 As part of the stylish compact range, the Panasonic Lumix DMC- FX60 certainly doesn't let itself down on looks. It's a thin, rectangular design with curved sides, a slim flash on the front which has a range of 60cm-6.0m in wide angle and 1m-2.8m at telephoto. That's a little on the low side but hopefully a flash won't be necessary as the lens has a new image stabilising system so you can use slower speeds to get the shots.